Working out to me is just part of my daily routine. Wake up, lemon water, snack, then head down to my basement to workout. 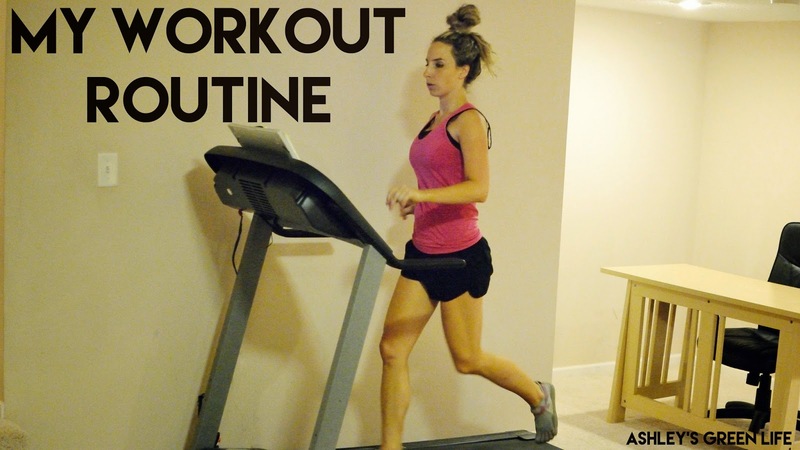 Keeping up with this routine daily helps me feel strong, energized, and toned. Skipping my workout leaves me feeling tense, sluggish, and cranky. 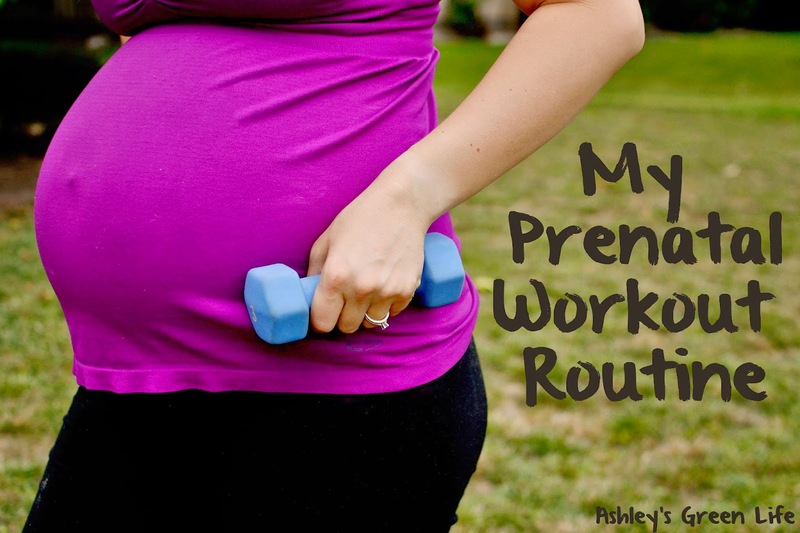 If you've read posts of mine before like "My Prenatal Workout Routine"
or "How I Got My Body Back After Baby"
...then you know the basics of my workout routine and how I do a 3-day rotation, but since I'm not pregnant or recovering from having a baby, I thought you might like to know what type of workout routine I do on a day-to-day basis. In my basement. Despite meeting my husband at the gym, I dropped my gym membership years ago and instead began doing all my workouts from home. My set up is pretty basic: I've got a a treadmill, a yoga mat, a DVD player, a TV, and lots and lots of workout DVDs. Now this space used to be pretty minimalistic in it's decor and we even used to jokingly call it "my yoga studio." 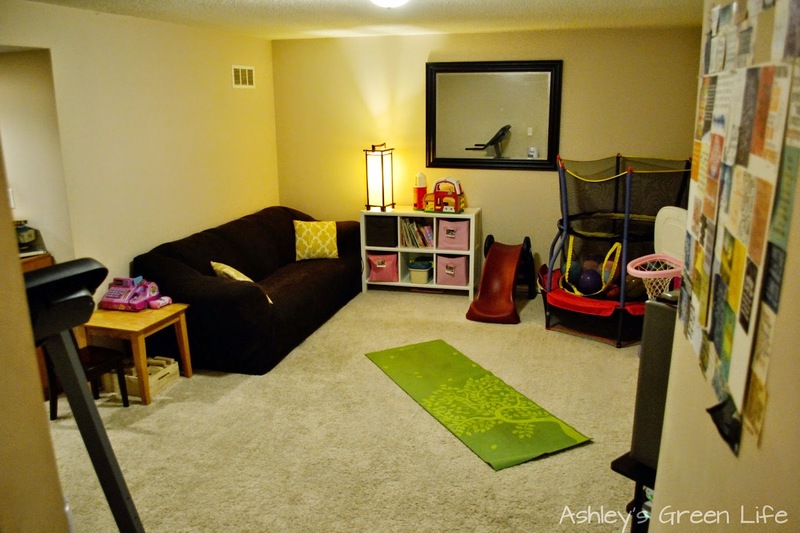 But since having kids, it's turned into our "playroom/yoga studio" but I don't mind. 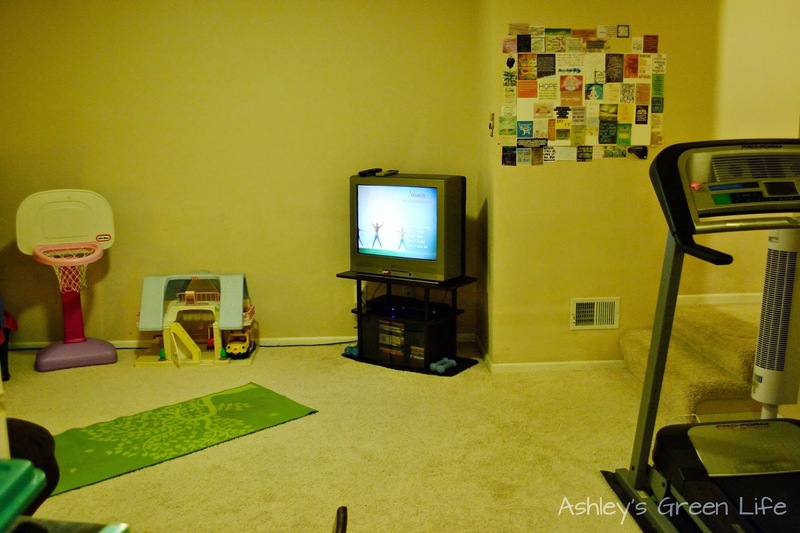 I'm glad to have a space to go where I can workout in the comfort of my own home and that can also entertain my kids. As you saw from the beginning of this post, I workout in the morning before work and before my girls wake up. In order to do this I get up at 4:45. I then have my lemon water, a snack like gluten-free toast with peanut butter, then I pack up food for me and the girls for the day. Then by about 5:30 I head down to start my workout. I've always been a morning workout kind of person. Something about getting my workout done first thing, leaves me no excuses not to do it. I can guarantee that if I had to wait until I got home from work to workout, my workouts would not happen. I would be too exhausted. But for some people maybe that's when you like to workout best. Working out in the morning helps me clear my head, think through what I want to do during my day, and helps loosen tight muscles or tension that help me feel strong and relaxed as my day goes on. My favorite part of working out in the morning is that I can do it without my kids. I love them, but working out with a one and three year old is basically impossible. I've done it before, but only in emergency situations! Mila used to crash my workouts before as you saw in this post, but as she's gotten older she has been sleeping more consistently and longer in the morning (due to the fact that she only takes one nap a day instead of two). 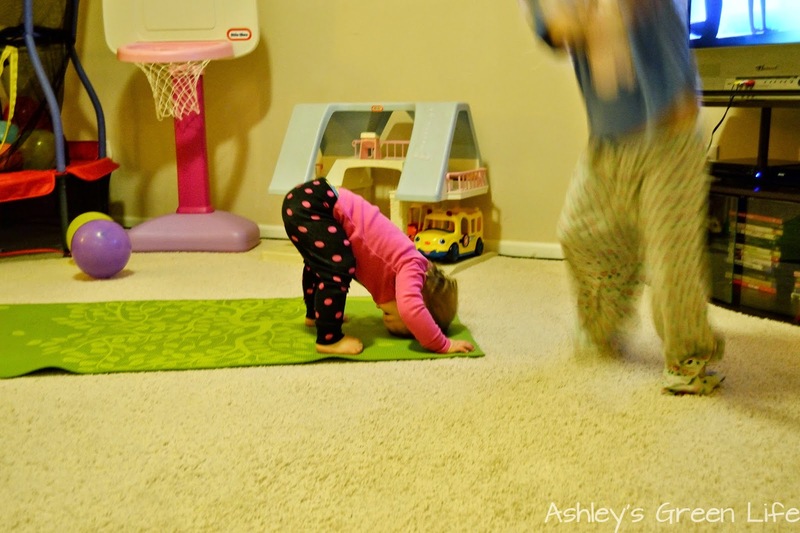 Like Mila's yoga post there? Oh and Avery is a blur...no surprise there! I know something moms struggle with is the idea that we have to put everyone's needs above our own, but by getting my workout in before my girls wake up I feel like I am able to take care of myself first, so I can take care of them better. I workout for about 45 minutes to an hour each day. These times usually vary by the type of workout I'm doing, but I usually aim to have close to an hour in. 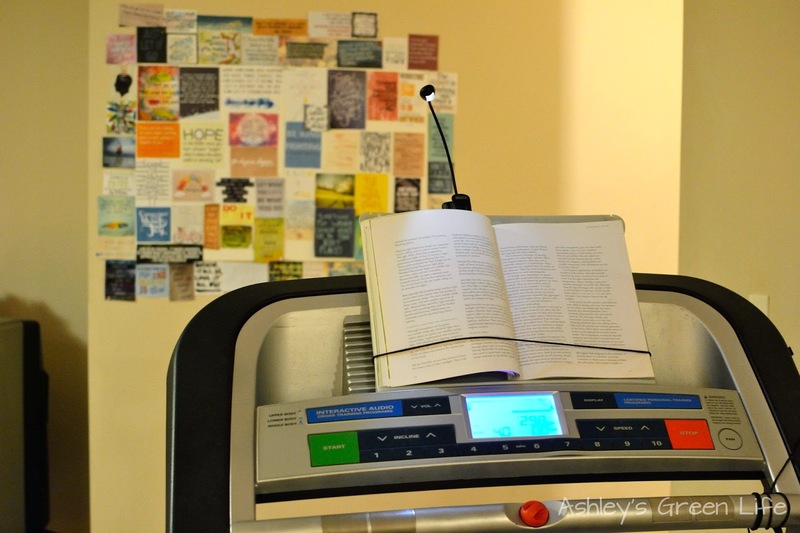 I read a cool quote one time I think by a gym or something that said, "The one hour you spend working out, powers the other 23." I couldn't agree more. As I mentioned above, if you've read my workout posts before, this info is nothing new. But I'll share it again as a refresher. I do 3 types of workouts in a rotation. I do these 3 workouts in order (not a strict order, I do switch it up depending on how I'm feeling) and then once I've done all three I go back to the start with Day 1 again. Here's a breakdown of the 3 types of workouts and the workout DVDs I use on those days. These workouts, specifically by Suzanne Bowen, have toned my body in ways I've never had before. A lot of the movements are small, repetitive, and so difficult in a good way that the muscle actually starts to "shake". When I first started these workouts I thought the shake was bad, that I wasn't strong enough, but it turns out the shake is good! As Suzanne says during the workout, "Shake to change!" (The shaking is what is changing the body, and oh it is so true.). These DVDs have brought tone and strength to my legs, upper body and abs that I didn't even have before I was pregnant with Mila. 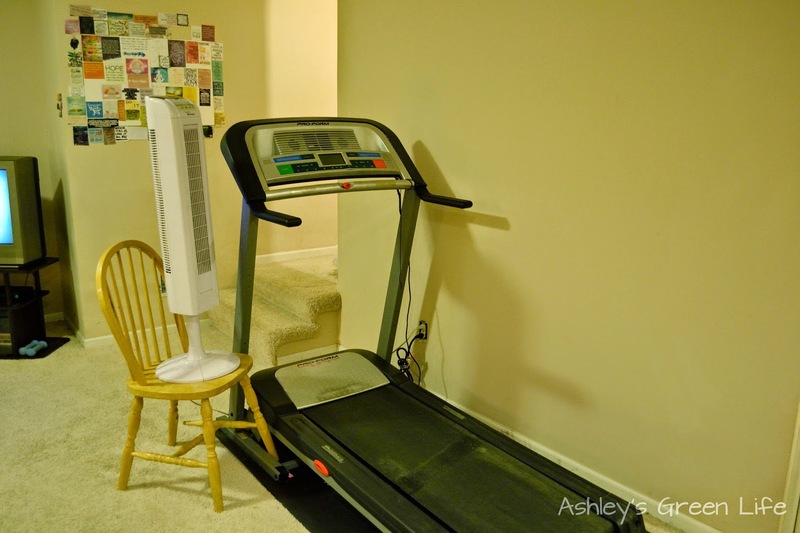 As you can see from my picture, you'll need a chair for these workouts, which is what you will hold onto for balance. These are a little more low-key than BarreAmped, but still effective and great if you love pilates. I like this group of DVDs from 10 Minute Solutions. There are 5, 10-minute sections each targets a different area like abs, lower body, upper body, everything all together, and then some stretching. Some segments are on the ground (aka mat work...which I do love to do at 5 AM), other segments are standing and use light free weights). 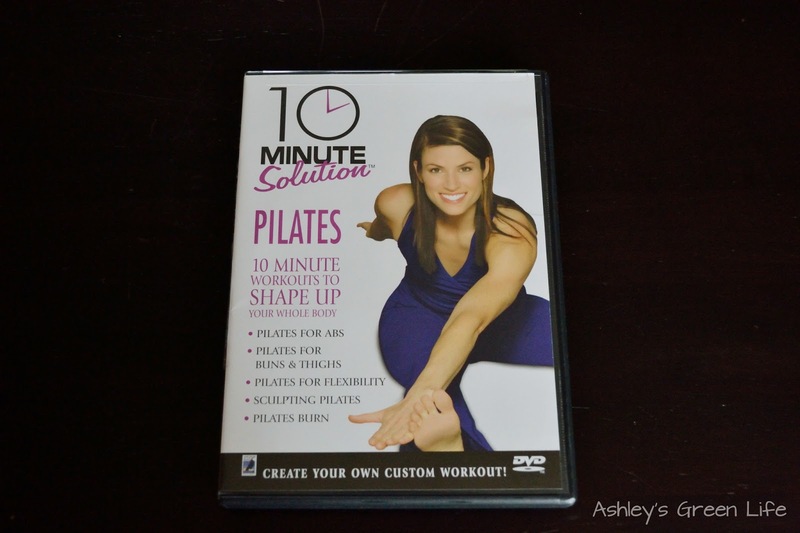 Here's some of my favorite pilates DVDs. Cardio day: For the cardio day I run/walk for 60 minutes. I like to run for 2-4 minutes, and then walk for 2-4 minutes and I repeat this for an hour. It keeps things interesting and keeps the calorie burn up. I wish I could just run 4-5 miles at a time without stopping, but for me, breaking it up with short walking breaks (at a fast pace), makes it more enjoyable, yet somewhat still effective. 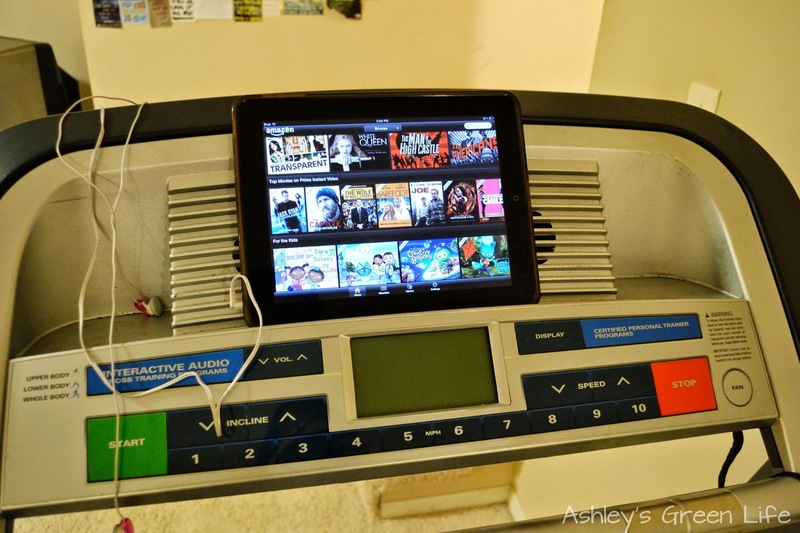 While I run on the treadmill I usually get caught up on my favorite TV shows like (The Bachelor, Downton Abbey, and The Walking Dead) by either watching them from my TV that's across the room, or on the Amazon Prime Video App on my iPad. Since I get up so early in the morning that means I usually go to bed around 9:00-9:30 PM and I don't often have time to watch TV at night (plus it seems to keep me awake right after I've watched an episode). So instead I use it as motivation for me to get my cardio workout in..."Want to watch last night's episode? 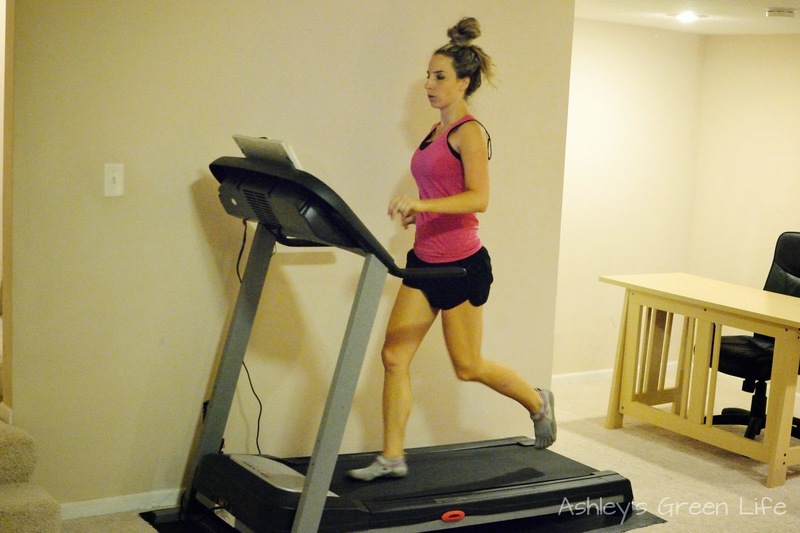 Hop on the treadmill, then you can watch it." Sometimes I read books as well, either real books or with my Kindle. Other times I just set my planner/idea book up too and just think about ideas for future blog posts. Granted it's a little tricky to run and write, but I just love the time to clear my head and think. Sometimes I come up with the best ideas during this time. 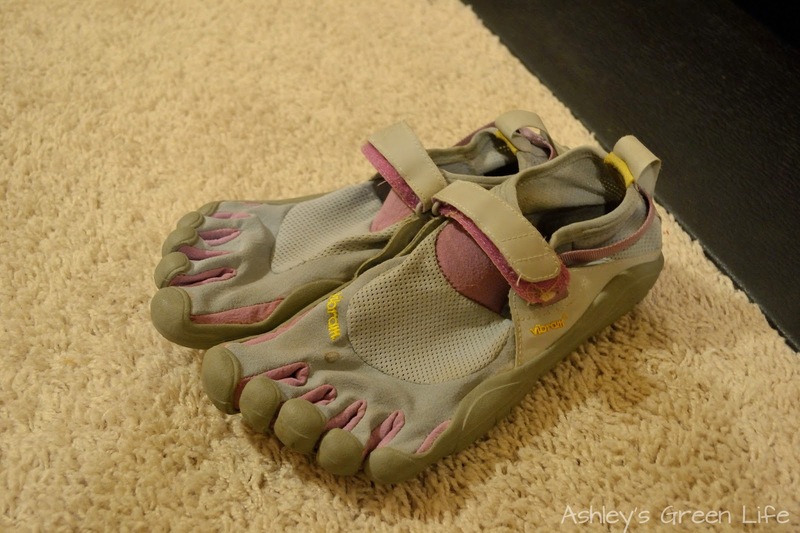 I love to run in my Vibram FiveFinger shoes, these totally changed the way I run and minimized a lot of hip and knee pain I used to feel when running. Want to learn more about these crazy "toe shoes" as their sometimes called? Read more here, "How to Get Started in Five Finger Shoes." Yoga Day: Now although my yoga DVDs can be pretty challenging at times, this is usually my "take it easy day." It allows my body a chance to get a good stretch and continue to tone up in a more low-key kind of way. After I've had a hard BarreAmped workout, or a long cardio day, I find my yoga day helps me recover, repair, and stretch out all those muscles I just worked. These workout DVDs have really helped to tone and strengthen my arms and legs, not to mention increase my flexibility and improve my balance/focus. 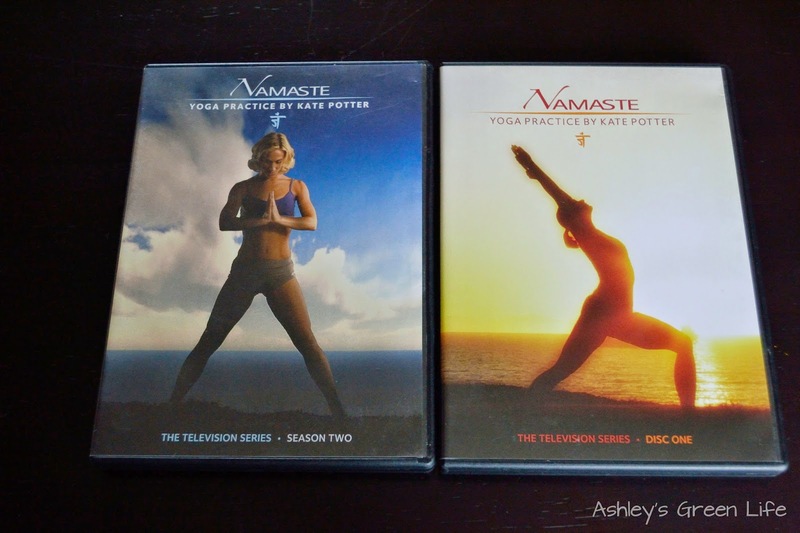 Namaste Yoga DVD Series (I do 2-25 minute episodes for one workout) These are my favorite workout DVDs that really got me into doing yoga on a more frequent basis. The scenery is amazing, the instructor's voice is relaxing, and when I do these on a regular basis I don't get so tight and tense, which helps me go to the chiropractor less. You can read more about it here in one of my first posts, "Namaste Yoga." So there you have it, that's my workout routine. 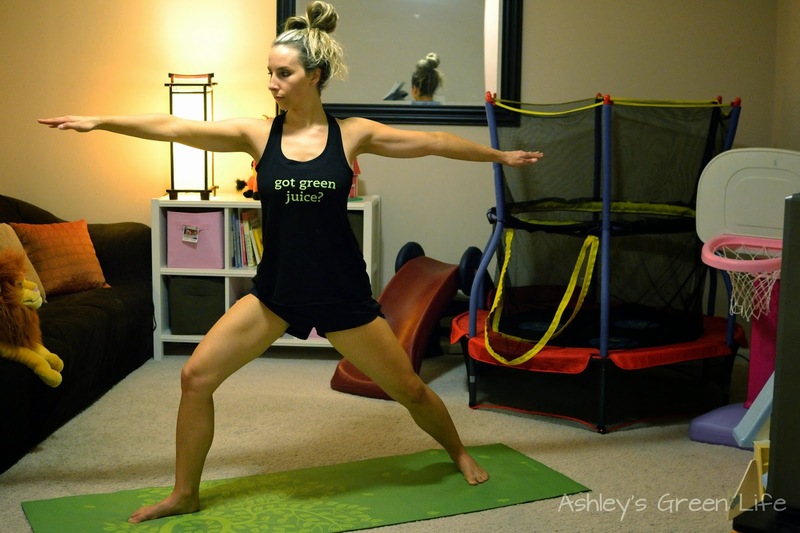 It's taken me a couple of years and a couple of pregnancies to really figure out the type of workout that works best for my body and that feels the best to me and for me, this is it. Everyone's body is different though, so don't be discouraged if the workouts I do don't feel right to you. Keep trying to find the ones that feel good to you and that you enjoy coming back to each day/week because that's the only way you'll see results is if you stick with it. Share below, what's your workout routine? Is it structured and routine like mine? Or do you switch it up and vary it to how you feel that day? Share your favorite workout DVDs below too.